RIGGER RAMBLINGS: The Calgary Roughnecks are set to battle West-Division rivals the Saskatchewan Rush tonight at the SaskTel Centre. The Riggers will look to build upon last Saturday’s 8-5 victory over the visiting Vancouver Warriors. Vancouver jumped out to an early 4-2 advantage but the Roughnecks pressed in the second half, adding five goals to overcome the Warriors and snap a three-game slide. Curtis Dickson registered a hat-trick for Calgary while Dane Dobbie (1g, 4a) led the Roughnecks with a five point effort. Rhys Duch (2g, 2a) netted a pair of goals and added two assists while Dan Taylor (1g, 1a) and Mitch Wilde (1g) tallied a marker each to round out the scoring for the Riggers. Mitch Jones led the Warriors with a goal and four assists while three others from Vancouver tallied goals in the loss including a pair of markers from forward Logan Schuss. 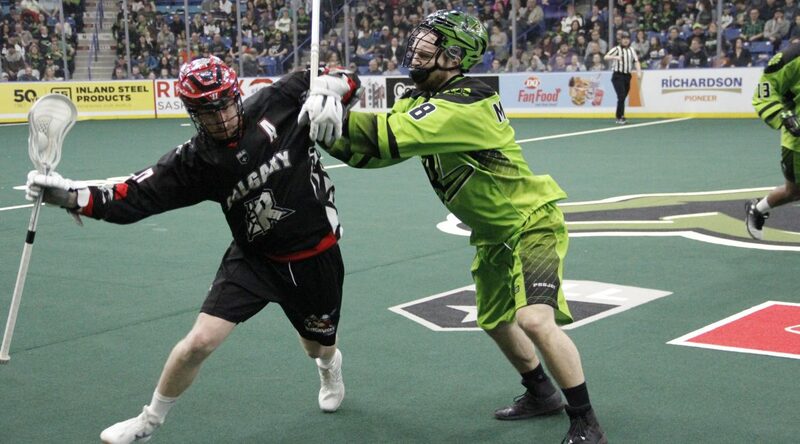 The Rush are coming off last Friday’s 16-13 loss against the Toronto Rock. SASKATCHEWAN: Tonight marks the first of three regular season match-ups between the Roughnecks and Rush. The two clubs last met in Saskatoon on Apr. 28, 2018, in a contest that saw the Rush defeat the ‘Necks by a score of 11-10 and sweep the Battle of the Prairies series 3-0. Calgary will be back at the SaskTel Centre on Saturday, Mar. 9 for the West Division rivals’ next meeting. Jan. 27/18 at CGY: SAS 13 CGY 12 OT… Ben McIntosh scored 0:46 into overtime to push Saskatchewan past Calgary. Feb. 24/18 at SAS: SAS 10 CGY 6… Rush score five second half goals en route to a 10-6 victory. Apr. 28/18 at SAS: SAS 11 CGY 10… Calgary outshot the Rush 46-43 but were not able to push passed the home team. ROUGHNECKS MONTH-BY-MONTH: December (2-1), January (1-3), February (1-0). ROUGHNECKS VS.: (BUF 0-0), (COL 1-1), (GA 0-0), (NE 0-1), (PHI 0-0), (ROC 0-0), (SD 1-1), (SAS 0-0), (TOR 0-0), (VAN 2-1). ROOKIE SPOTLIGHT: Defenceman Reece Callies recorded his first NLL point with an assist in Calgary’s victory against the San Diego Seals on Dec. 28. The 23-year-old has tallied one goal, recorded in the Riggers’ loss to New England on Jan. 12, and two assists in six games. The Langley, BC product was drafted by the Roughnecks in the first round, 13th overall, in the 2018 NLL Entry Draft. Callies spent the 2018 season with the Langley Thunder of the WLA. He recorded eight points (6g, 2a) in 14 games. SPECIAL TEAMS WATCH: Calgary’s power play is ninth in the NLL at 39.02% while the penalty kill is first in the league at 64.10%. ROUGHNECKS VS. DIVISION: West (4-3), East (0-1). WE MEET AGAIN: The Rush lineup features three former Roughnecks in Travis Cornwall, Matthew Dinsdale and Jeff Shattler, who still holds the Riggers’ franchise record for most assists with 416 and for loose balls with 1106. Cornwall was drafted by the Roughnecks in the first round, 7th overall, in 2011 and tallied 28 points (13g, 15a) in 41 games over parts of four seasons. Dinsdale, also drafted by Calgary in the first round, 7th overall, in 2012 spent parts of three seasons with the ‘Necks recording 30 points (8g, 22a) in 33 games. Shattler amassed 684 points (268g, 416a) in 183 games over 11 seasons with the Roughnecks. DÉJÀ VU: Alternate captain Dane Dobbie is closing in on the franchise’s all-time record of 416 assists, held by Jeff Shattler. Dobbie has 793 points (389g, 404a) in 168 games. Last season the forward became the franchise’s all-time leading scorer finishing the season with 751 points (371g, 380a) in 160 contests to surpass the previous mark of 684 also set by now-Rush forward Jeff Shattler. MARCH PARTY PACK: For a limited time, the Roughnecks are excited to offer a two-game party pack for only $40 (plus applicable fees and taxes). Choose any two games in March and receive second-level seating at 57% off. All matchups take place on Saturday nights with 7:00 p.m. starts and feature the $5 Happy Hour starting at 5:30 p.m. Watch the Riggers take on the Toronto Rock on Mar. 9, the Colorado Mammoth on Mar. 16 during the St. Patrick’s Day Party with an extended Happy Hour from 5:00-7:00 p.m., or battle the San Diego Seals on Mar. 30. Visit CalgaryRoughneck.com/partypack to score yours today. DEL BIANCO’S ASSISTS FOR KIDS: On Dec. 15, Roughnecks goaltender, Christian Del Bianco, and the Roughnecks Foundation proudly announced a new charitable program, Del Bianco’s Assists for Kids presented by Ascent Consulting Ltd. The partnership will see both Del Bianco and the Calgary Roughnecks Foundation direct $30 each while Ascent Consulting Ltd. donates $500 for every regular season assist recorded by the Calgary goaltender. In addition, Del Bianco is auctioning off his helmet on ElevateAuctions.com, which features the KidSport logo. Auction details will be communicated in the coming weeks. Del Bianco tallied 17 assists during the 2017-18 regular season and hopes to increase his point total this year. MILESTONE MARKERS: On Feb. 2, Rhys Duch scooped up his 800 loose ball. On Jan. 20, multiple players hit milestones: Dane Dobbie recorded his 400th career assist while Mitch Wilde recorded his 50th career helper and Riley Loewen eclipsed 200 loose balls. On Jan. 18, Tyson Bell picked up nine loose balls to eclipse 300. On Jan. 12, Tyler Burton and Greg Harnett both played their 100th NLL career game while rookie Reece Callies recorded his first NLL goal on the same night. On Jan. 6, first round draft pick in 2018 Shane Simpson tallied his first NLL career point with a goal and two assists while Chad Cummings eclipsed 150 loose balls. THE ROAD AHEAD: The Roughnecks now head east to face the Buffalo Bandits on Feb. 16 before returning to the SaksTel Centre for a re-match against the Rush on Mar. 2. Their next home game will be Mar. 9 when they host the Toronto Rock at the Scotiabank Saddledome at 7:00 p.m.